White House senior adviser Jared Kushner attends bilateral meetings held by President Donald Trump and President of China Xi Jinping at the Great Hall of the People on Nov. 9, 2017, in Beijing. When he’s not practicing martial arts at the Cobra Kai dojo, Trump’s son-in-law and senior adviser Jared Kushner seems to be consistently engaging in questionable business dealings. White House attorneys are looking into whether hundreds of millions of dollars’ worth of loans secured by Kushner’s family violated laws or federal ethics regulations. The deals, revealed last month by the New York Times, included a $184 million loan from Apollo Global Management LLC and a $325 million loan from Citigroup Inc.
Executives with both Apollo and Citigroup met with Kushner at the White House but denied that there was any talk about the loans during those meetings. 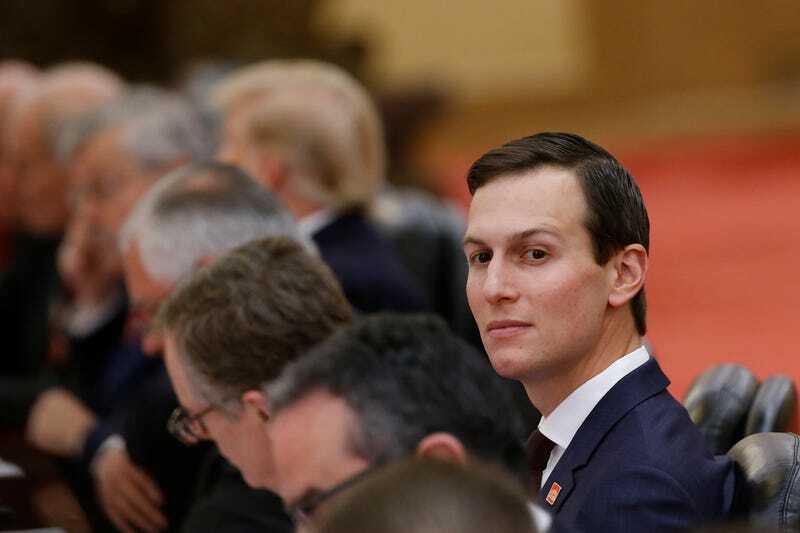 Citigroup notes that the loan issued to Kushner Companies was for a Brooklyn, N.Y., real estate development and that “Chief Executive Officer Michael Corbat, who met with Kushner less than a month before the loan was secured, didn’t know about the transaction,” Bloomberg reports. And this, folks, is what happens when you have a private citizen with major business dealings inside the White House. The Trumps know this, and you guessed it: They don’t care.